War Blogging updates right after the introduction. Dear visitors. We see from the traffic spike that many of you are visiting for the latest updates on the clashes up North between the IDF and the Lebanese Army. As you already know, the Muqata is the leading source, in the English language, for up-to-the-minute action reports when it comes to important events in Israel (wars, flotillas, elections, etc. ), but the Muqata is much more than that. We invite you to continue to stay and regularly visit the Muqata, not just for our up-to-the-minute action reports, but also for our deep and meaningful posts (particularly JoeSettler's and our reader's comments and feedback) that delve into the important issues of the day facing the Jewish and Israeli world (not to mention our waffles too). Also, we invite you to visit our fellow war blogger IsraellyCool who is also liveblogging the conflict (but come back here afterwords). To be among the first to know, follow the Muqata on Twitter. 10:43 PM Map of attack. 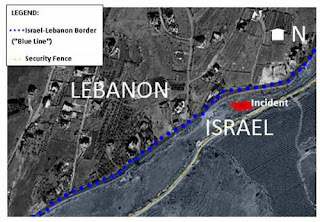 As you can clearly see the attack from Lebanon happened on the Israel side of the Blue Line (demarcating the border). The fence is set a few meters inside Israeli territory for tactical and functional reasons. 10:11 PM Still looking for a good copy, but here is the series of events today on Israeli news (thanks to Eitan). 8:08 PM Entire attack caught on video tape. Will publish it here as soon as we have the link. conducting routine maintenance work including clearing bushes from the area. This sort of activity is crucial to keep an open line of sight, to prevent attacks and kidnappings, like the one in the summer of 2006, which was in a similar location. This crucial work was fully coordinated with UNIFIL, and there was nothing unique about it. A Lebanese sniper opened fire towards IDF forces in a clear and blatant violation of UN security council resolution 1701. 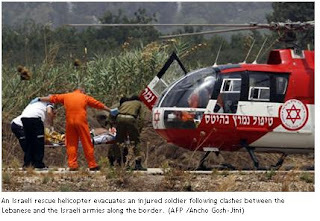 The IDF retaliated with artillery and helicopter fire. IDF intelligence is investigating if this was premeditated attack. Noah Pollak (Commentary Mag): Why was this so well documented on the Lebanese side? Seems odd. Lt. Col Avital: We are investigating. Were snipers brought especially for this attack? We will know in next few hours. Michael Totten: Rumors of Hizbollah fighters on scene. Is this true? Lt. Col Avital: Right now, full responsibility on Lebanese Army. This will be checked. Lt. Col Avital: Soldiers conducting maintenance work; it was the IDF commanders who watched the work who were shot at. The LAF opened fire not at the soldiers who were doing the routine maintainance work on the fence, but at the commanders who were standing nearby observing the work. this indicates that it was a preplanned attack not in reaction to the work on the fence. The IDF estimates 4 casualties on their side. After the initial exchange of fire, we were requested to suspend our fire so that they could evacuate their wounded. roughly half an hour after we suspended our fire, LAF shot an RPG at one of our tanks. They missed the tank and our tank returned fire. IDF only opened fire in response to our soldiers being shot at and wounded. This is the most serious incident along the northern border since 2006. The Border is currently calm. Lt Col (res) killed: Dov Harari. Critically wounded (res) company commander (Captain). 6:16 PM Unfortunately confirmed. One senior officer killed - Lt. Col Dov Harari. Another injured in today's ambush. IDF officially calling today's attack an ambush. 5:55 PM Terrorist attack in South. Terrorists shoot near Kibbutz Nirim at team working on fence. 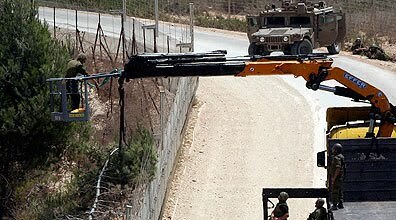 5:25 PM Work on fence was done in coordination with UNIFIL. 5:15 PM Received this (Reuters) photo of an LAF soldier after they attacked. 5:10 PM Sharp-eyed readers of the Muqata noted that UN soldiers (blue berets) are standing next to LAF soldier as they prepare to fire on Israel earlier today. Photographers were also on site - before the attack. Lebanon will call for a UN Security Council emergency session to discuss Tuesday’s clashes between the Lebanese Armed Forces (LAF) and Israeli Defense Forces (IDF) along the border earlier in the day. 4:51 PM Why would Hizbollah start a war with Israel now? One view is to deflect rising criticism over Hizbollah's involvement in the assassination of Lebanon's Prime Minister. Five years on, the assassination of Lebanese prime minster, Rafiq Hariri, still dominates political life in Lebanon. Tensions are on the rise due to rumours that a special UN tribunal has been investigating his death in a car bombing. 4:40 PM UK Press reporting senior IDF officer killed. 4:24 PM Apparently, this is the Lebanese Army RPG that started the unprovoked attack on IDF forces. 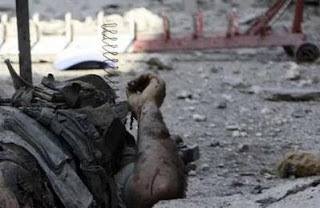 Foreign reports continue that there are casualties among IDF soldiers, though there has been zero confirmation of this from the IDF Spokesman's unit. 4:22 PM Reports that IAF Warplanes have struck at an Lebanese army base. IDF forces and Lebanese Army and Hizbolla forces are advancing additional forces on the Israel-Lebanese border. 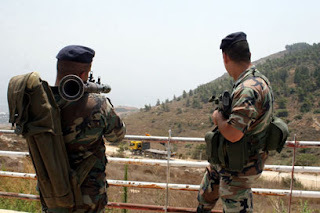 Earlier today during the mid-day hours, the Lebanese Armed Forces (LAF) fired at an IDF position along the Lebanese border in northern Israel. The force was in Israeli territory, carrying out routine maintenance and was pre-coordinated with UNIFIL. The border area is east of the Israeli town Metula. The incident occurred west of the internationally recognized "Blue Line" (the border between Israel and Lebanon) and east of the security fence, thus lying in Israeli territory. The IDF force immediately returned fire with light arms at a force of the LAF, and the IDF also made use of artillery fire. Several minutes later an Israel Air Force (IAF) helicopter fired at the LAF Battalion Command Center in Al-Taybeh, damaging several LAF armored combat vehicles. The IDF holds the LAF responsible for the incident that disrupted the calm in the region, and its consequences. The Israeli public in the Galilee region to carry on with their routine way of life. 4:19 PM Reports that IAF just attacked LAF forces in Taibe. 3:50 PM Lebanese sources are saying that fighting has resumed. No updates on this from IDF which last reported quiet at 3:00 PM. 3:19 PM Foreign photographers on site before the attack, taking photos of the LAF aiming RPGs at the IDF position. 3:12 PM Unconfirmed foreign sources reporting that IDF officer was killed in attack. We are tracking this story. Reminder - this is unconfirmed. 2:59 PM 3 Lebanese reported killed. The context of the pictures in unclear, but it appears to be IDF soldiers adding cameras on the fence the IDF soldier is cutting down trees next to the fence (all within Israeli territory) and LAF soldiers preparing to attack them. 2:19 PM One Lebanese Army soldier confirmed killed. Possibly additional Lebanese soldier killed too. 2:14 PM All indications are that the IDF soldiers were definitely on the Israeli side of the border when fired upon. Pretty much confirmed that no Katyusha's hit within Israel. Hezbollah claims that Israel was trying to install tracking cameras. 1:57 PM Clashes may be over. No confirmed information yet on injuries. Conflicting reports regarding the Katyusha fire, but that seems to have not happened according to latest reports. 1:30 PM JPost: IDF soldiers were reportedly on a routine patrol. They were operating past the border fence, but within Israeli territory, since the fence does not always exactly parallel the border. The cause of the clashes was unclear. Lebanese forces may have misconstrued the IDF patrol's position and thought they had crossed the border. 1:27 PM Muqata sources in Northern Israel report that the exchange of gunfire has subsided. Mortars and gunfire were directed at IDF troops near Misgav Am. 1:24 PM Reports of attack on IDF troops near the South Lebanon border. IDF responding with tank, artillery, attack helicopter and sniper fire. Updates coming shortly. Hey isn't that UNIFIL soldiers standing next to the LA soldiers in the 4th pic from the top? What's the sorce/s of the pics? Indeed. Here is a picture of a UNIFIL soldier waving a white flag from the same location, same time. I think there's also a UNIFIL vehicle behind the LA soldiers. May HKB"H protect the lives of all the Israeli soldiers. There are no LAF soldiers. They are all Hezbollah. The difference between the Lebanese army and Hezbollah is a legal fiction. Where is Gen'l Sherman when you need him? They have tonns of pictures and a minute per minute too. It's in french but they are good. you guys are great - thanks for the updates! Could you provide a source for this? Would be grateful! Ministry of Foreign Affairs is the source. 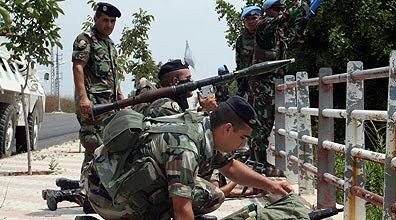 Found a picture on "Le Monde" clearly showing UN soldiers protecting the Lebanese Army. Link from Noah, one of our readers. This is a question that is clearly going to need some serious answers. 1) incident took place on Israeli territory: gaps between border fence and border, routine maintenance work, clearing bushes, kidnapping done in place like that. all coordinated with UNIFIL. 2) Sniper stand decided initiate fire; clear violation of 1701. 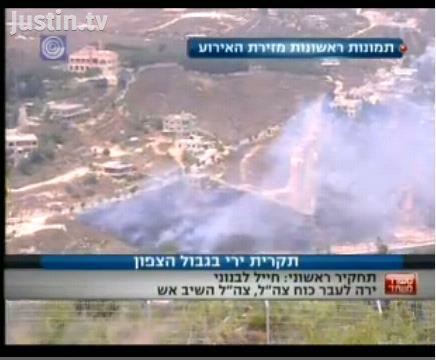 Retaliation with artillery and helicopter; IDF now looking into whether it was preplanned. 4) Commanders watching were fired at, not the soldiers involved in the cutting; commanders watching from a distance not at scene of the tree/shrub cutting. that's why the response so strong. Today's unprovoked attack by the Lebanese army against the IDF, took place in Israeli territory along Israeli's Northern border. In some areas, there is a gap between the IDF security fence and the actual border, which is where this attack took place. IDF soldiers were conducting routine maintentce work including clearing bushes from the area. This sort of activity is crucial to keep an open line of sight, to prevent attacks and kidnappings, like the one in the summer of 2006, which was in a similar location. IDF intelligence is investigating if this was premiedtated attack. we estimate 4 casualties on their side. It appears that Tzahal deliberately sent soldiers into an area that they know is also claimed by Lebanon but WITHOUT ANY ARMORED PROTECTION! Surprise, surprise; unprotected Israeli soldiers are fired on. Have all Israeli military leaders lost their brains? Or have they simply decided to jeopardize the lives of some of their soldiers unnecessarily? And so Jews died, not because of the predictable enemy, but because of Jewish stupidity. If I'm missing something here, please tell me! Yeah, Hillel. You're missing that it was Lebanese soldiers who did the shooting. Why some people always turn to blame the IDF first is beyond me. Geez. The US didn't provide any RPG-7's to the LAF. The sniper rifle could have been US made, or Russian, or French. Note that the bulk of the LAF's tank force is still the Tiran T-55. It really doesn't matter much where the weapons came from. What matters is how and where they were used, by and and against whom. It doesn't matter why they want to kill us all, it only matters that they do. Israel should call for an official investigation of this incident (like Goldstone/the flotilla). When the UN refuses, Israel should use that as an excuse to reject the conclusions of other UN investigations, which as we know are applied unevenly.